My namesake bloomed this week! In 2008, I couldn’t resist a try at the Asiatic lily ‘Linda’. Her visit is brief, but worth it for that vibrant golden orange, just lovely against the last of the larkspurs. This daylily in the den bed companions the orange theme. When I got it years ago, it was simply called ‘Tawny.’ This could be the “ditch lily” (Hemerocallis fulva) but mine isn’t invasive. The white mistflowers, also called boneset (Ageratina havanensis) are growing like crazy and flowering way ahead of their fall schedule. I’m adding more! They’re perfect for those part shade spots to entice butterflies and other pollinators. Yarrow (Achillea millefolium), one of the first natives I planted, is another pollinator love. It runs like crazy, but the delicate ferny foliage is quite a distinctive counterpoint to brisker leaves. And you can’t beat its tenacity in drought, freeze, flood! In front, feverfew towers above the Yucca rupicola x pallida. Apparently bees don’t like its flowers but it hasn’t scared them off from other flowering plants nearby. Here’s another orange for you, Mexican honeysuckle (Justicia spicigera), a true draw for hummingbirds. On Daphne’s Pick of the Week, she explains how to grow it in your shady spots. Viewer Nancy Yerks sent in this from her garden, photographed by friend Bob Phillips. She moved them from a former garden and last year they were a little slow to establish. They’re now quite at home in the southwest corner of her garden where they get shade from a cedar elm. Mine are still young and will take another season to fill my partly shady areas and look like these in Paul Lofton’s garden! Daphne notes: It’s not a vining plant at all; it’s actually related to shrimp plant (Justicia brandegeana), another great part shade to sun lover that attracts hummingbirds. On Backyard Basics, Lyda Guz from The Natural Gardener steps in front of the CTG cameras for the first time to share her passion about plants for butterflies! Many of her selections attract other pollinators, too. Plus, she reminds us to plant larval food hosts to invite your “happy hour nectaring” adults to lay some eggs for a return audience in a few months. Lyda explains how to make a simple puddling spot, which butterflies love to nab some water and salt. Ripe fruit is a bonus. Another shot from Paul Lofton’s garden. Gourds are another way to attract pollinators with their summer flowers that turn into cool things we can use! 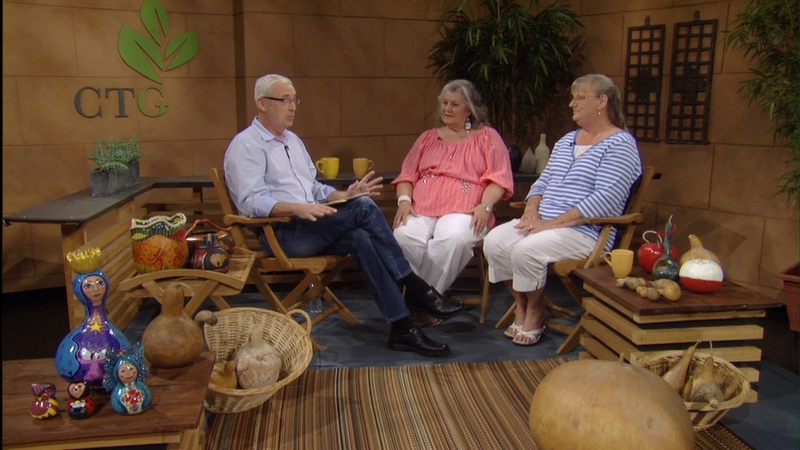 This week, Tom joins Suzanne Haffey from the Capital of Texas Gourd Patch/Texas Gourd Society and Charlotte Yeisley from Diamond Y Farm in Smithville to explain how to grow and craft with these historic plants. At the Texas Gourd Society’s show and sale every fall, get the most beautiful bowls, lamps, baskets and artwork. I’ve got several, but here are a couple that Suzanne made. Gorgeous! Meet Charlotte and her husband Ed at the River Valley Farmers’ Market in Smithville for their organic produce. Or head to Smithville and ask for the Diamond Y Ranch for a personal tour, where they’re growing lots of gourds and vegetables. Find out more about how to grow gourds and prep them for crafts with Trisha Shirey. 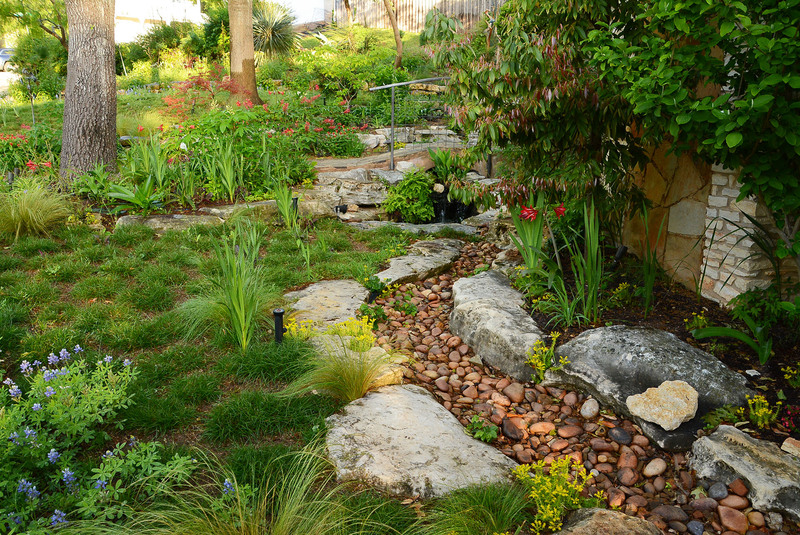 On tour, we head to Hutto for a healing garden that celebrates family, community, and wildlife after a scrape with cancer. In my garden, I’m doing lots of touch-up pruning right now. What do you need to do? Get Daphne’s answer on how/why/when to prune and how to fertilize as we head into the heat.